Luxury 2 bed, 2 bath apartment. Suit families, couplesand golfers. The local brasserie on the opposite urbanisation is highly recommended - a wonderful eatery with lovely views. Fully managed, on site service: Our apartment is managed by an excellent English couple. On arrival at our apartment you will be met by one of our agents, shown to the apartment and allocated all keys. They can be available to help with any enquiries, eg, places to go, car hire, trips etc. - a full list of their services can be allocated on request. They will also ensure that the apartment is in tip top condition with freshly laundered linen and towels. Golf Information: Golfers can expect to be thoroughly spoilt for choice on the Costa Del Sol. In the immediate area are several courses including the 9 hole Casares Golf & Country Club, Finca Cortesin (a Jack Nicklaus Academy Course) and the stunning 18 hole Dona Julia course. Casares Golf & Country Club, Dona Julia and Finca Cortesin are within five minutes of the Casares del Sol development. There are more than twenty first class golf courses in the surrounding area including the most famous gold clubs of Valderama, San Roque and Sotogrande. A 5 minute walk to Casares Golf. On arrival we were met by Bob and Suzanne who talked us thru every thing we needed to know about the property which was spotless. We had a problem the 1st night which we reported and it was dealt with very quickly so it did not spoil our holiday. The pool area was spotless and never to busy, so you could enjoy a swim and plenty of sun loungers to sunbathe. The surrounding area had bars and restaurants within driving distance or we liked the golf club nearby which was in walking distance. Port Duquesa which was 10 mins drive away was particularly attractive. Gibralter,Mijas,Marbella and Puerto Banus are also close by and worth a visit as is Ronda but our favourites were Benahavis and Estapona.We cannot fault a thing from our first contact with Louise who was extremely nice and helpfull to the end of a very nice and relaxing holiday. Excellent appartment with all the necessities and extras. It was great to have all the modern utilities available and to have the possibility to cook "at home". The area was clean, silent, secure and child frendly. The pool had a security guard at all times. The apartment was ideal for our 5 person family and the children enjoyed there time especially at the pool. We also used public transport and it's really affordable and works well. Taxis are mainly not willing to take parties of five. We had a great time and we got all the necessary support from Louisa, as well as from Bob and Sue - Thanks! A smart apartment on a quiet urbanisation with all the things you need for it to be a home from home including Sky TV, a washing machine and a microwave. I particularly liked little touches like a couple of cool bags and plastic plates and cups, a bucket and spade and inflatables in the store room - things you wouldn't take with you but are essential for an easy, enjoyable and stress free holiday. From first contact Louise made the booking process and the arrival process as easy as possible with regular and prompt communications and accurate directions. We were met at the apartment by their property managers and shown around, even though it was midnight. The apartment itself is comfortable - it's not huge but certainly not small. There would be plenty of space for 2 adults and 2 kids (there were 3 of us, me, my wife and our 15 month old boy (top class travel cot provided). There's a 20m pool (with lifeguard) close to the apartment and my little one loved to splash in the baby pool once he'd got used to it. The gardens are green and lush and they were planting orange and lemon trees whilst we were there. It's well cared for. There's a mountain backdrop in one direction and in the other you can see the sea. You'll need a car to explore the area and get to the shops and bars in the towns and villages. There is a smart golf club bar within walking (or stumbling) distance but we knew kind of what to expect from the description of the property. We particularly liked La Duquessa and seemed to end up there most nights. You should not restrict yourself to the port/marina area though but take a walk along the promenade (with a couple of beach bars) towards El Castillo. Everyone was really friendly and my wife didn't want to come home. We'll book again. This apartment is ideal for a family of 4/5 with loads of space etc. 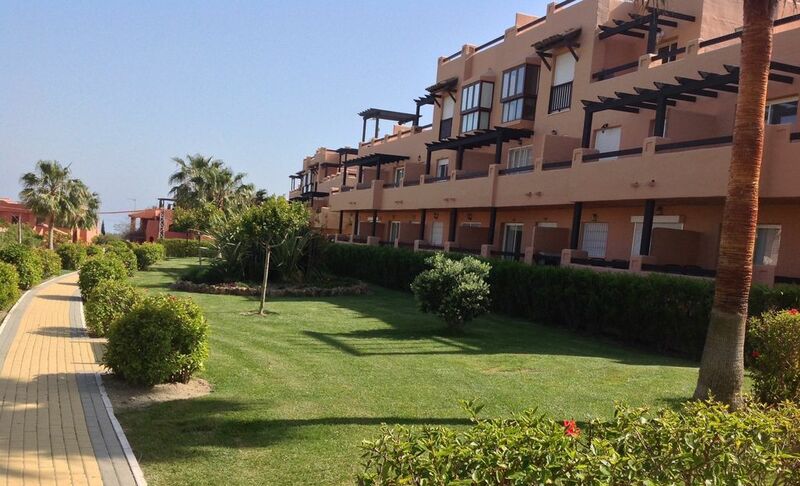 It is well appointed and situated a short walk from the pool.The pool area is really clean and not at all busy. There is a main pool and a small Childrens pool (knee high water) for toddlers. The apartment complex is completely fenced off and totally secure. Out and about there is plenty going on (Sotogrande and Duquesa are great places to spend the evening). Whilst there is a lovely beach within 10 -15 minutes walk a car is really a must. The local market is good fun as is the Roman mud bath (if you can find it!!) the locals keep it top secret. There are good quality supermarkets in both directions a short drive from the apartment. A visit to the old village of Casarses is an eye opening experience (like going back in time 30 years) with the old ladies all grouped together chatting on one side of the square and all the husbands on the other side having a few pints! We came back from our 14 night holiday feeling really refreshed having thoroughly enjoyed our time in Spain. The owners and their representatives were a pleasure to deal with throughout and we would have absolutely no hesitation in recommending this apartment to others. We will definately be booking again in the future. As a footnote the apartment was absolutely 'spotless' on arrival. There are also warerparks within a 40 minute drive and Selwo Adventure Safari Park is a great day out. Ideal apartment and location for us as a family with young children. The apartment was very spacious, modern and clean. It was well equipped including a large fridge freezer, washing machine, AC and Sky TV (take your own viewing card!). Nice extra touches were things like sandwich bags, Cool bags with plastic freezer blocks for taking cold drinks to poolside/beach. Plastic picnic sets for eating outside. Garage underneath the apartment block to keep the car cool in the day. The pool was viewable from the balcony at the back and had a small shallow pool for little ones, a larger pool for everyone and had a lifeguard on duty all day. There were free sun loungers and a clean tidy toilet block. The grounds were well maintained and had views of the surrounding mountains. The location was quiet which suited us, but a quick car journey took you to many coastal towns which we managed to fit in during a week, including Sabinillas, La Duquesa, Estapona and further afield Marbella. Newly opened supermarket was about 5-10min drive and a larger one (Carrefour) was present in Estepona (recommended for British brands such as Robinsons juices!). Easy enough to travel from Malaga airport in just over an hour on the toll roads. We were met efficiently by the agents and shown around. Only improvement would be a sat-nav code to the apartment and/or directions up from the last roundabout as we first ended up in the Urbanization Majestic and not Casares del Sol as they are close together.